"Fun, it's in our Nature!" The Recreation Division provides a variety of recreational and educational opportunities for all ages and abilities including aquatics, ice skating, health and fitness classes, environmental education programs and lifetime activities. We produce three guides per year: WinterSpring, Summer and Fall. 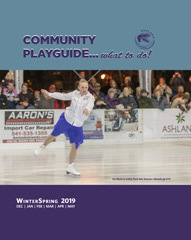 Our WinterSpring guides are direct-mailed to all Ashland and Talent households. The summer and fall guides are generally mailed to those who have taken a class with us in recent past. If you would like a hard copy of our three annual guides mailed to you, please complete our online form, ashland.or.us/MailMyGuide. If you would prefer an email notification when a new digital rec guide is available, please Email us!